As a white girl riding on a whole lot of privilege, I sometimes come late to the party of awareness. I get some curiosity, learn something, then try to join the mission. One that might not be mine and may have been a Movement long before I decided to head to Washington last Saturday. #StayWoke has been around a while but I just happened to notice it last year. #StayWoke wasn’t my hashtag in 2008 when Erykah Badu said it first. It wasn’t mine when Black Lives Matter spread it in 2013. Nor is it part of my sarcastic repartee with others when some people use it now for mundane moments. Check out Charles’ Pulliam’s history of the term. So I don’t think I can start using it today in 2017 and somehow be hip, be with it, join the crowd I think might find me a little bit more of a member for knowing it. 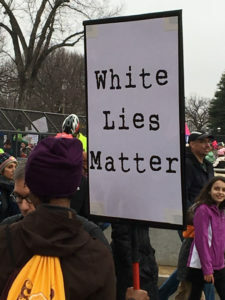 Seen at the Women’s March. Photo by Lyn Fairchild Hawks. This is not political correctness but just basic respect. Who said it first? Why’d they say it? How’s it said now? Know the history. Ask. Learn. My new habit of mind for 2017 is Fill my daily life with questions. About people’s interests, actions, days. About the issues and events around me. Read and ask. Then read some more. Tell me more about that thing you love. Tell me how you came to believe that. What is the source? How do you know? What are several other sources saying? The other habits of mind will flow from this behavior. If you ask, and then you know, you might just act. With some wisdom about which actions might actually get results. Just because I heard it/saw it/now you know it doesn’t mean it’s mine. Step carefully. Listen. To what others have to say. And instead of chattering, act on the sentiment. I can let the heart speak through the action. It’s not lost on me that “stay woke” sounds so much better than stay awake. Rhythm and cadence; speech that punches and stays. It’s why America adores black culture. Then borrows, co-opts, appropriates, plagiarizes, steals so much of it with an airy blitheness, blindness, and greed that can’t be denied. Even up to the work of the First Lady. I’m waiting for the new one to steal “When they go low, we go high” for her anti-bullying campaign. The time is gone for saying “Obama’s got this” and ignoring the hate and harm that Republicans like Mitch McConnell have perpetrated on this country with their blockades, their denials, their destruction. All the while Obama fought, I stayed quiet and restful, sleeping my days away. McConnell and Ryan and their compatriots, the You Lie Boys of Joe Wilson ilk, they’ve now been given all the keys to the kingdom, and it is white privilege at its worst. The new America I must awaken to help build has space for everyone, someone. Unless you belong to what Aziz Ansari calls “the lower case kkk.” That will be not be tolerated. The walk of empathy is part of the decision to wake up white every morning to my privilege. To wake up middle class. To wake up healthy and physically able, with health care. To wake up educated. To wake up supported by a network of family and friends. Rest when you can for the next four years. But stay awake, Lyn. Stay awake.